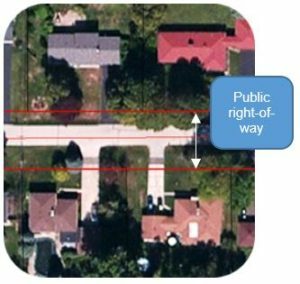 The public right-of-way includes public roads and an area of land between private property and the edge of the road. If you have a drainage ditch and driveway apron they are located within the right-of-way. In Wind Point, the public right-of-way typically extends 30 feet from the centerline of the road in both directions. Residents are responsible for maintaining the lawn in the right-of-way, but may not have work done in the right-of-way, such as grading, landscaping or replacing a culvert, without first obtaining a right-of-way permit from the Village. Signs are prohibited from being placed in the right-of-way. A permit is required for: driveway resurfacing; work within the ditch, shoulder or apron; street opening; new or replacement culverts. Permit applications require review by the public works supervisor and/or village engineer. Depending on the work, there is a permit fee and/or deposit. Download the permit application from the Licenses & Permits page.